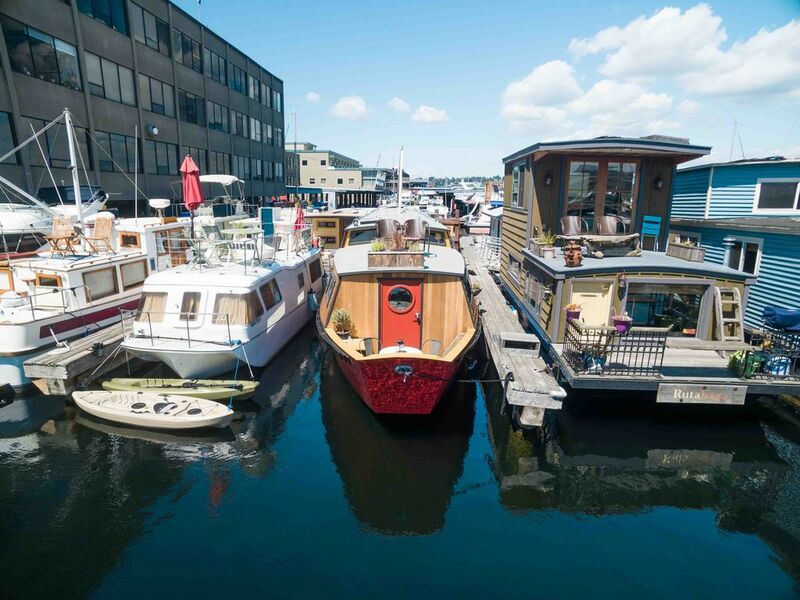 Turnip has a cool feel and is great for someone who wants a genuine, interesting houseboat experience yet still all the comforts of home. She has a junk style design, which is a common in Asia, a great roof for sitting on, and hobbity archways inside that really create the space. - Parking out front the marina office building at a cost of $1 per hour. Weekdays, it is free before 9 am and after 4 pm. Weekends are free as well. Note: due to guest parking passes being taken by guests repeatedly, they are no longer available. You will have access to the place all yourself. I will have shower items for you, towels, sheets, etc. Access to the boat is via a self-checkin process. All access and reservation instructions will be included in the confirmation page after booking. Just a phone call away for whatever you need. The area sits conveniently close to downtown Seattle and tucked between Fremont and Ballard. For those checking out the city, this is a great location. For those on business, also super convenient and comfortable. The closest grocery store is about a mile away in Fremont (PCC) so keep that in mind. - It's important to know that this is a boat and not a house, and that's its charm. While it does have everything you will need, its not like living in a house - doors are smaller, toilets are funny, stairs are steep, and sometimes the boat rocks. - Seasickness and dizzyness is unlikely unless you are very sensitive. - The ceiling height is not standard, max 7', plus there are a few smaller accesses to different parts of the house. If you are very tall, you may find this irritating. The entrance to the boat requires bending and stepping down. If you have physical difficulties, this may not be the best match. - I have 3 kayaks available first come, first serve. - There is a little cafe at the marina which does has WIFI, coffee, beer, wine. It is not open weekends. - You will also receive full check-in instructions and the house manual before your arrival. There are several space heaters that even in colder times keep the space quite warm. Parking is available onsite. It is paid from 9 am to 4 pm, M-F, and is free any other time. There are 3 kayaks available for use. They are shared with guests of my other houseboat so are offered first come, first serve and are easy to get a hold of since only 6 boats have access to them. We had a great stay at this little boat. Had some concerns on arrival. The owner Emma was responsive to our issues. All in all, we enjoyed our houseboat experience. We had a great time on this boat. It was a very unique experience. Beautiful views, and a great location that allows you to get all over the place in a short amount of time. I do wish there were more curtains/blinds in the boat, but for the most part you have a good amount of privacy. The shower was an adventure figuring out how to work effectively. The boat was much more roomy than I had expected, and we had a great experience. Cutest boat in the marina area! Great little house boat! Perfect for 2 people. We loved the little houseboat. It was a bit hot this time of year. Definitely a 5 star if the hot water heater breaker had not constantly tripped while showering. Staying on the house boat made our Seattle trip the best it could be! I am happy with all the communication and our travel experience! Really cute place. Perfect for a Seattle adventure. Great place to stay when visiting Seattle. The check in process was a tad confusing but once we got it all figured out, no other issues.